High-waisted dresses, open-necked shirts, and un-powdered curls abound in the extravagant age of the Regency era (about 1795-1837). A period in Britain associated with the rise of a handsome young prince who became King (George IV) and the work of novelist Jane Austen, this time left its mark on fashion, too. Many men followed the lead of the romantic poet Lord Byron, whose “Byronic” curls cluster at the front of his head. Women, too, wore their hair in natural curls and followed a style of dress inspired by the classical fashions of Greece and Rome. The Regency era ended in 1837 with the ascension of Queen Victoria, who ushered in a new style that would bring fashion into the twentieth century. John Smart, English (1741–1811). Portrait of a Woman, 1807. 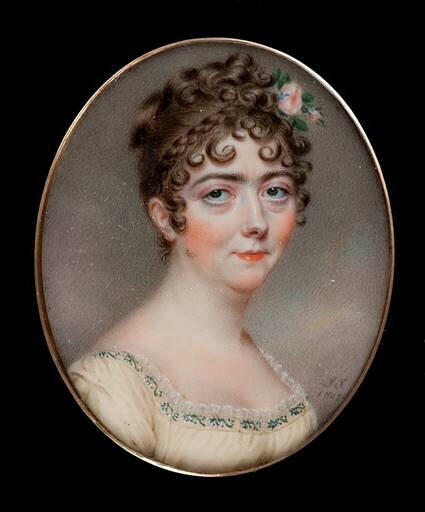 Watercolor on ivory, 1 ¾ x 1 ½ inches. Gift of the Starr Foundation, Inc., F65-41/48. Henry Bone, English (1755-1834). 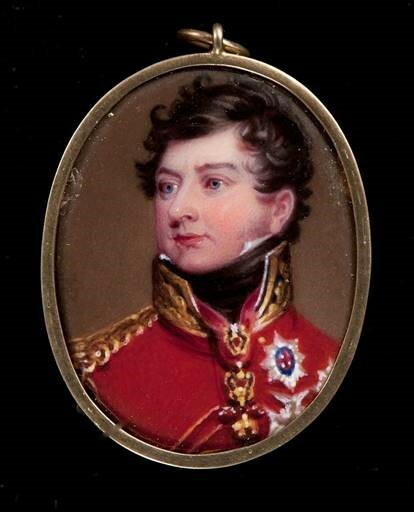 Portrait of King George IV of England, 1821. Enamel on copper, 1 ¼ x 1 inches. Gift of Mr. and Mrs. John W. Starr and the Starr Foundation, Inc., F58-60/134.